Who can use QuickWave STUDENT Release? How do I receive a licence for QuickWave STUDENT Release? Is the licence for QuickWave STUDENT Release time limited? Is the support included in the QuickWave STUDENT Release? Can I install QuickWave STUDENT Release together with the full version of QuickWave? Can I publish the results, pictures etc. obtained from QuickWave STUDENT Release? What is the maximal number of FDTD cells I can simulate with QuickWave STUDENT Release? Can I open full version QuickWave project prepared in the QW-Editor in the QuickWave STUDENT Release? Can I open QuickWave STUDENT Release project prepared in the QW-Editor in the full version of QuickWave? 1. Who can use QuickWave STUDENT Release? QuickWave STUDENT Release can be used by everyone. 2. How do I receive a licence for QuickWave STUDENT Release? The licence for QuickWave STUDENT Release is included in QuickWave STUDENT installation. 3. Is the licence for QuickWave STUDENT Release time limited? Yes, the licence is time limited and can be used for 90-days from the first run of QuickWave. You can always receive a new licence file, extending the usage of QuickWave STUDENT Release for the next 90-days. 4. Is the support included in the QuickWave STUDENT Release? The technical support privilege is not included in QuickWave STUDENT Release. 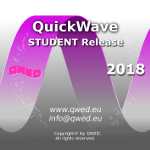 The QuickWave STUDENT Release users can take advantage from FAQ documents for QuickWave software available on QWED's website. 5. Which Operating Systems are supported? The QuickWave STUDENT Release supports Windows 7, 8, 8.1, and 10 desktop operating systems, in both, 32 and 64-bits versions. 6. Can I install QuickWave STUDENT Release together with the full version of QuickWave? The QuickWave STUDENT Release can be installed together with the full version of QuickWave 2017 and later, but it is required to set the appropriate licence number for STUDENT Release (see STUDENT_Licence_Installation.pdf) and choose the right preferred licence (in QuickWave Licence Manager) for the full version of QuickWave. 7. Can I publish the results, pictures etc. obtained from QuickWave STUDENT Release? Yes, you can freely publish all the results obtained with QuickWave STUDENT Release but the acknowledgement or reference to QuickWave software must be included in the publication. 8. What is the maximal number of FDTD cells I can simulate with QuickWave STUDENT Release? 200000 (two hundreds) FDTD cells. 9. Can I open full version QuickWave project prepared in the QW-Editor in the QuickWave STUDENT Release? Yes, but if the number of FDTD cells exceeds 200000, you will not be able to save the project or run simulation. 10. Can I open QuickWave STUDENT Release project prepared in the QW-Editor in the full version of QuickWave? No. The project prepared in QW-Editor of QuickWave STUDENT Release can not be opened in full version of QuickWave.